Dental crowns and bridges work to provide a prosthetic restoration for missing or damaged teeth. Crowns, or caps, are placed over the surfaces of the natural teeth and can also protect dental implants. Bridges can be used to fill gaps resulting from missing teeth. They are anchored by the natural teeth or crowns adjacent to the gap. A dental crown can be applicable to your situation if you have teeth that are damaged or decayed. A bridge can also be available if the missing tooth is surrounded by other dental structures. During the placement of a crown or bridge, your teeth will be evaluated to determine the proper spacing. An impression will be created from your bite and used to create a mold. A restoration designed from porcelain material can be customized in color to match the natural shade of your teeth. You can also receive a temporary restoration while the dental lab is fabricating your crown or bridge. After the final restorations have been placed on your teeth, they will need time for healing and adjustment. Sensitivity to heat or cold may be experienced during this period, which is expected and can be managed. Ibuprofen can be prescribed to reduce any soreness in the gums following the treatment. 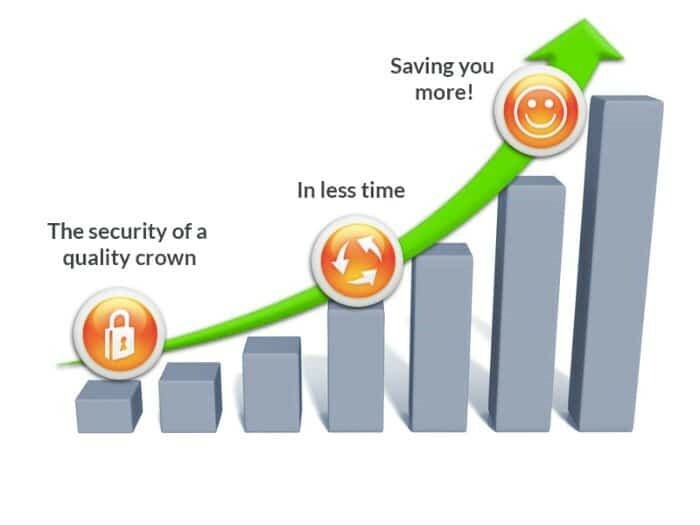 We can fit an OVC dental crown in just 1 appointment which saves you time and hassle. Because the OVC is faster and more efficient it is also more affordable. OVC dental crowns are made of proven durable dental materials so you can be confident it will last. OVC dental crowns are designed to preserve your remaining tooth structure. This means less drilling. 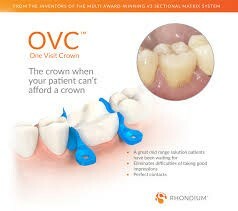 OVC crowns look just like your natural teeth so you can’t tell the difference. An excellent option for heavily filled and/or weakened Amalgam filled teeth.